Jamie Oliver is tired of your complaining. “I hear it all the time: I don’t have the time to make meals at home. It’s an excuse—plain and simple,” he says. The chef, cookbook author, and founder of Food Revolution Day (today, May 17) says that you can make healthy, tasty, inexpensive meals at home in less time than it takes to grab a greasy bag of fast food from the drive-thru. Check out this recipe, which piles on the protein with chicken and quinoa, packs in vegetables, and comes together quickly—with plenty of leftovers. 1. Cook the quinoa according to package instructions. 2. As the quinoa cooks, add the jalapeno, spinach, scallions, cilantro, and mint into a food processor and blitz until finely chopped. 3. On a large sheet of wax paper, season the chicken with the allspice, paprika, salt, and pepper. Fold the paper over and use a heavy-bottomed skillet to bash the chicken until it’s about ½-inch thick. 4. Heat 1 Tbsp olive oil in a large skillet over medium-high heat. Add the chicken and the peppers and cook until the chicken is blackened and cooked through, 3 to 4 minutes on each side, and the peppers are tender. 5. Drain the quinoa and rinse under cold tap water. Drain well and then transfer to a large bowl. Add the chopped spinach mixture, lime juice, remaining olive oil, and salt and pepper, to taste. Mix well. Transfer the quinoa salad to a large serving platter. 6. 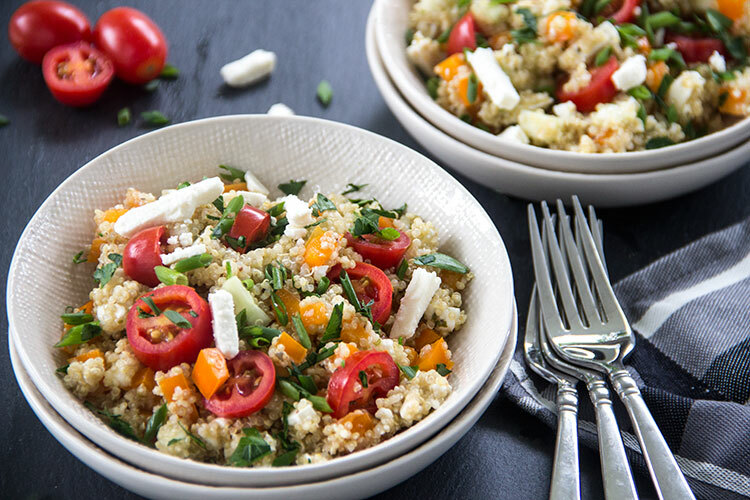 Top the quinoa with the mango chunks and cooked peppers. Use a teaspoon to scoop curls of the avocado over the salad. Slice the chicken, toss it in the pan’s juices, and add to the salad. Add the crumbled feta and watercress. Serve with yogurt. Makes 4 servings.